Gloria June Levar Drayson - One to enjoy life, became free from the debilitating effects of dementia and mini strokes on 5 February 2019, aged 77, in Riverview, NB. Within the community she shall be remembered as a franchisee for A&W restaurants and her commitment to community associations for Ukrainians, women, education and others. 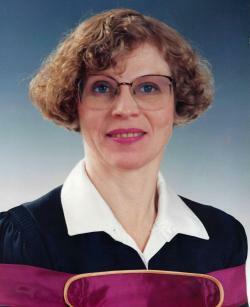 She was a member of Mount Royal United Church and St. John’s United Church. She is preceded by her late parents, John Levar and Helen & Nick Litwinowich, her husband, Ed Drayson and other friends and family. She shall be remembered by children, Kevin Drayson, Bonnie and Chris Still, Andrew and Juanita Drayson and other family and friends to whom her parting message was "I love you all." A memorial service, to be recorded, shall be held on Sunday, February 10, 2019 at 2:00 pm at Fergusons Funeral Home, 1657 Mountain Rd, Moncton, NB (858-1995), with The Rev. Aaron Billard officiating. Reception in the Funeral Home Reception Centre following the service. Interment will be in Fair Haven Memorial Gardens.